THE QUIREBOYS have vowed to carry on with their U.K. tour after some of their equipment was stolen. The band's storage unit in Bedford was broken into and various pieces of music equipment and personal belongings were swiped. According to BBC News, some of the equipment, including pedal boards and amplifiers worth "thousands", was later found dumped in a car park. But two vintage guitars are still still missing. The theft was discovered on Thursday after THE QUIREBOYS returned from Norway following a run of European shows. "At one point we thought we wouldn't be able to go ahead with our U.K. tour," guitarist Paul Guerin told BBC News. "But thankfully, most of the stuff has been found now and we've been overwhelmed by the support of people who offered to help us with replacements. "A Facebook post about what happened has had more than 3,000 shares and it's been really humbling to have had such an unbelievable response from companies and people we don't even know who wanted to help." Items stolen included merchandise, a pedal board, tuners, digital delay and a suitcase containing Guerin's clothes for the tour, which starts in Leeds on Thursday. 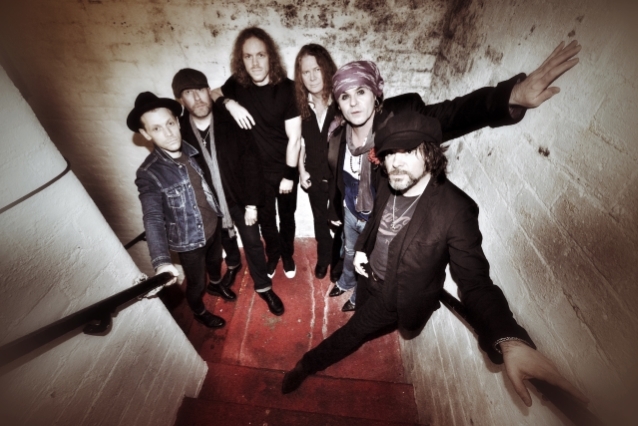 THE QUIREBOYS will release their new album, "Amazing Disgrace", on February 8, 2019. As you may have heard, The Quireboys storage unit has been broken into and many of the bands music equipment and personal belongings have been stolen. This happened in Tavistock Street, Bedford. All the info about this can be heard on the live interview on BBC3 with Guy. Please keep your eyes open and hopefully between us all, we can recover these items.